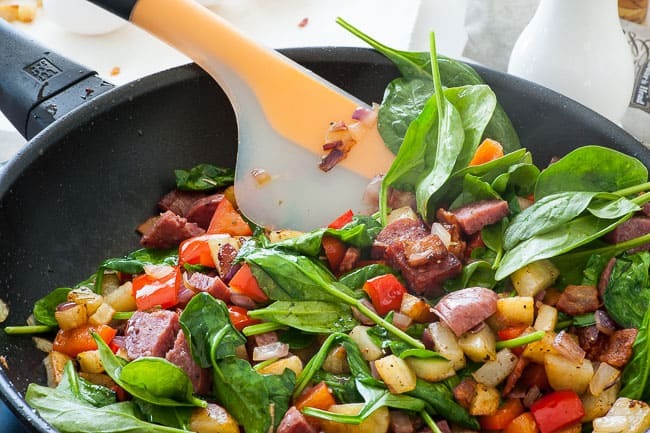 This breakfast hash gets kicked up flavorwise with both bacon and salami, then add color and nutrition with some baby spinach. 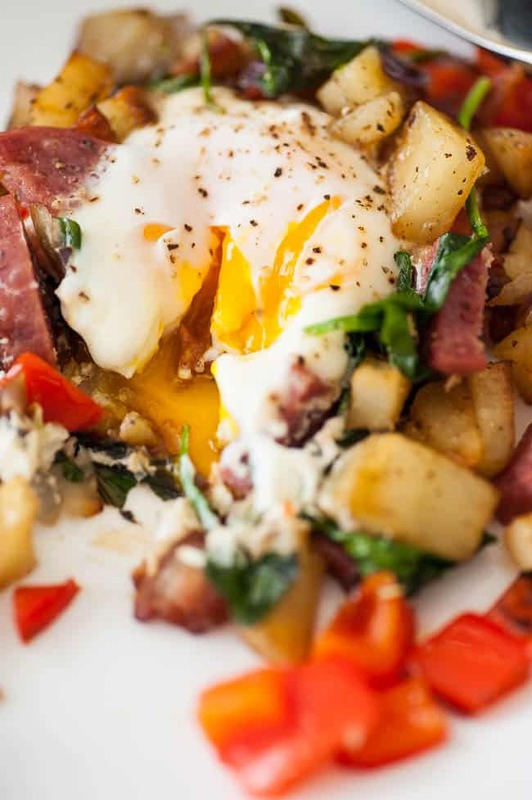 This breakfast/brunch meal will grab your attention. 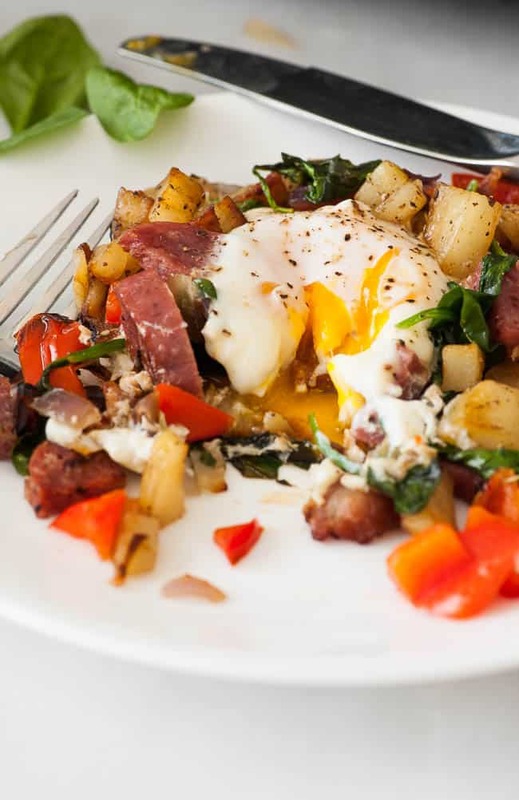 If you like a hearty breakfast or brunch, this recipe is for you. It’s savory with 3 kinds of proteins…that’s about 22 grams of protein. Potatoes, onion, and red bell peppers complete this tasty dish. It comes in at under 500 calories and will probably keep you satisfied until dinnertime. This was a fun photo shoot using my induction cooktop and my new favorite non-stick skillet. The skillet is from J. A. Henckels, Zwilling Madura Plus Forged 11″ nonstick fry pan. It is by far the best non-stick pan I’ve used. It is forged aluminum with a steel insert in the base to allow it to be used on the induction cooktop. The pan is a heavyweight, coming in at about 3 pounds. The bottom of the pan is flat, and with proper care, should stay flat forever, (unlike other non-stick skillets I’ve owned, that have warped, and I threw away). Eggs will slide around on the non-stick surface like nothing I’ve seen before. And this great pan costs $59.95 right now on Amazon with free shipping. I’m thinking everyone needs to get one of these! The bacon bits get browned first and while the bacon cooks you can chop up the red pepper, onion and potatoes. 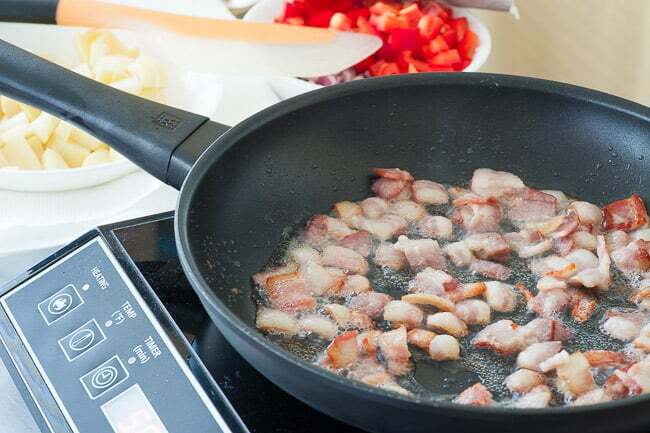 Once the bacon is finished, use a slotted spoon to get it out if the skillet and place the bacon bits on a paper towel lined plate. 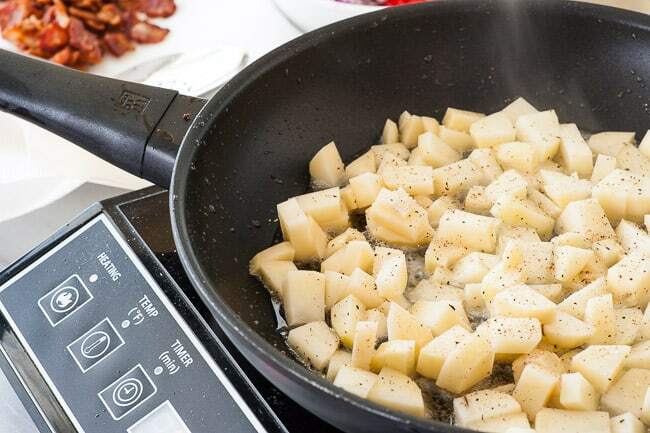 Keep all the bacon grease in the pan and add the potatoes, lightly salt and pepper them, and cook until browned. This may take 15 to 20 minutes depending on the water content in your potatoes. Mine let off quite a bit of liquid and this had to be evaporated before the potatoes would brown. 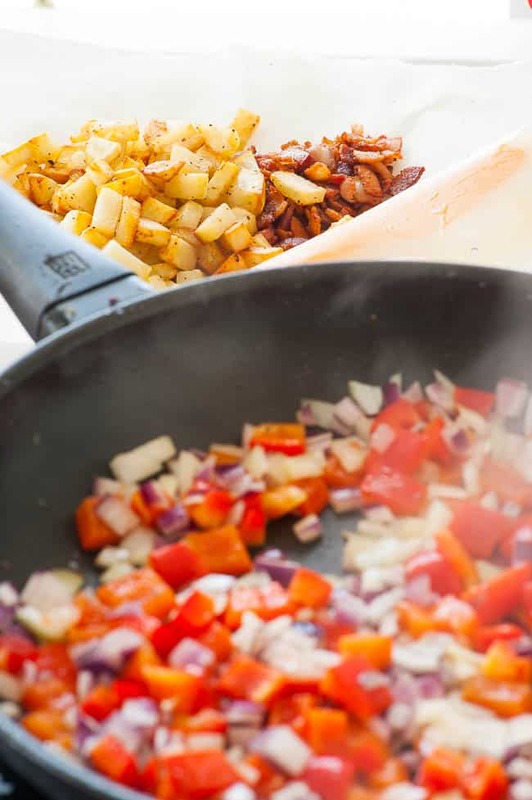 Place the browned potatoes on the paper towel by the bacon, then add a couple teaspoons of olive oil in the skillet and add the onion and red pepper. Lightly salt and pepper them and cook to soften, 3 minutes. Add a teaspoon of dried rosemary at this time too. Next, add in the salami and cook for a couple more minutes. 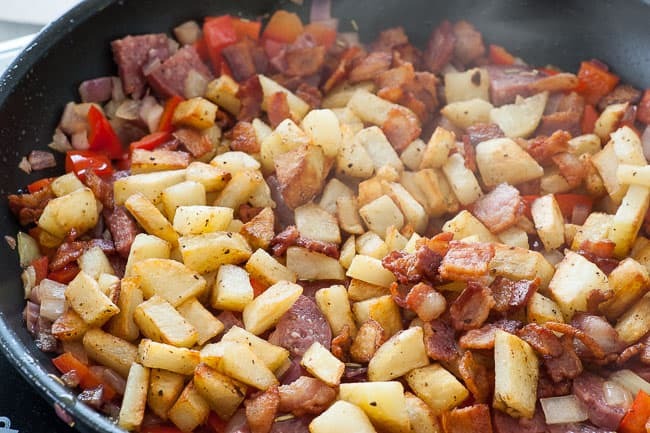 Add the potatoes and bacon back to the skillet and stir all the ingredients together. 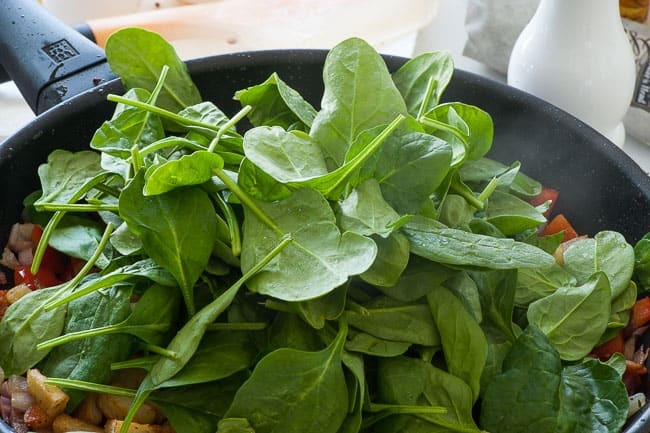 Lower the temperature of your cooktop and add a couple good handfuls of baby spinach and fold in to wilt. Here’s a photo of my favorite spatula which is really an omelet turner. It is an OXO Good Grips Flip and Fold Turner and I use mine every day. It is a highly recommended tool available for $10. 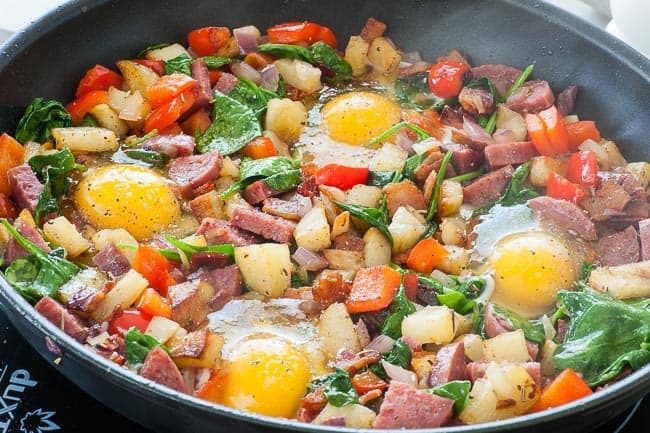 Once the spinach is wilted, use a spoon to make 4 pockets in the breakfast hash and crack an egg into each. Turn the cooktop to medium and put a lid on the skillet, cook until the egg whites are firm and the yolk still runny which takes about 6 minutes. 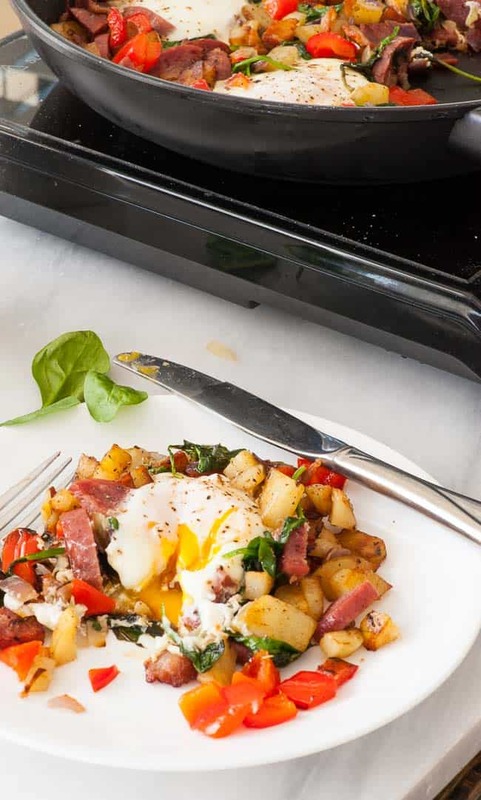 Serve the hash right away separating it into 4 portions. 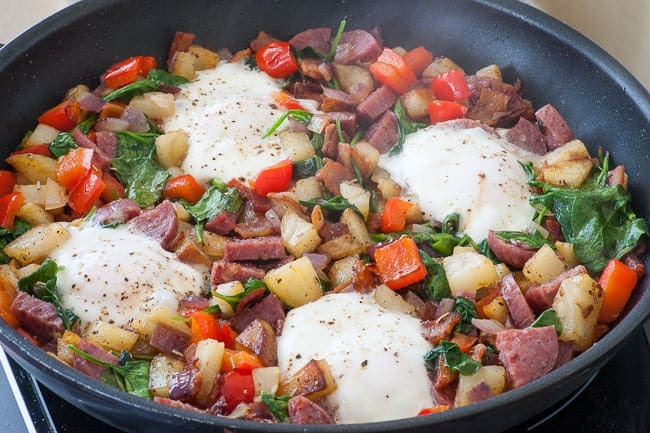 The flavor of this is fantastic and it’s a breakfast or brunch meal that will stick to your ribs and has lots of protein to power your day. 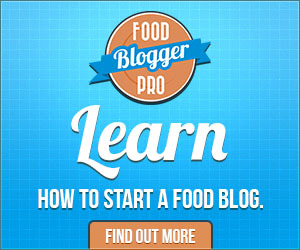 Disclaimer: This recipe post contains affiliate links. 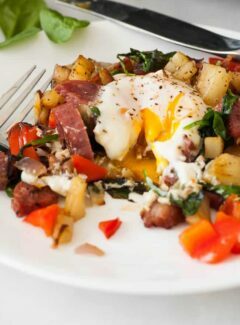 Breakfast or brunch meal, tastes fantastic. 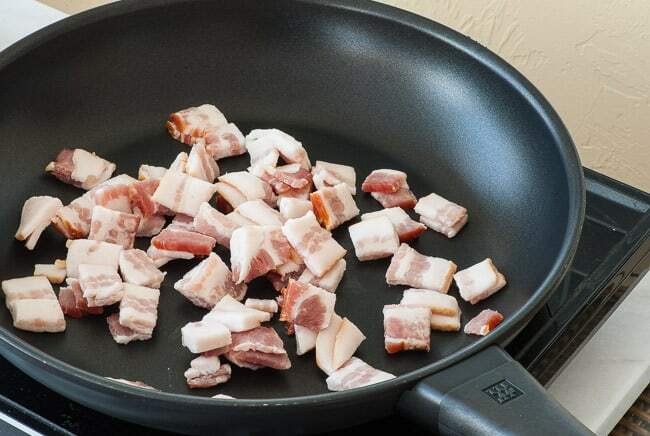 Brown the bacon in a skillet and then set aside on a paper towel lined plate, leaving the bacon grease in the pan. Cook the potatoes in the bacon grease until lightly browned, 15 to 20 minutes, and set aside with the bacon. Add a couple teaspoons of olive oil to the skillet and saute the pepper and onion with salt, pepper and rosemary, to soften, 3 or 4 minutes. 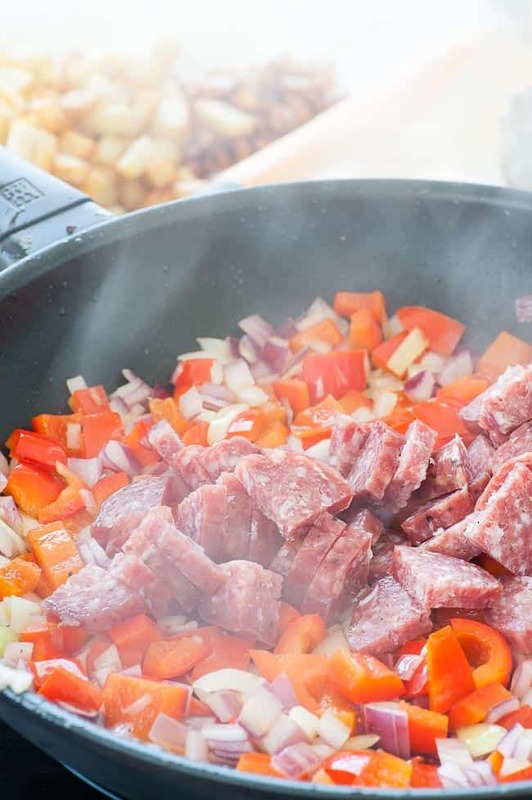 Add the salami to heat it up, 2 or 3 minutes, then add back the bacon and potatoes, stirring to combine. Lower the heat slightly and add the spinach and fold in to wilt, 3 to 4 minutes. Use a spoon to make 4 pockets, crack an egg into each, turn the heat to medium, cover with a lid, 6 minutes until the egg whites are firm and yolk runny. Serve right away....hot and yummy! Oh this is sooooo good; even warmed over leftovers are yummy!